I’d been looking forward to today’s Sierra Club hike throughout a challenging week filled with classes, student conferences, 90 minutes of testimony at a deposition and lots of meetings. Big Falls is a famous local attraction and I’d never been there. I carpooled with Chris on the way to Santa Margarita. Dense fog met us at Cuesta Pass, and at our meeting place, people shivered in the cold. There were 35 of us eager to tackle the nine miles and 1700 foot elevation gain announced on the Outings page of the monthly Chapter newsletter. I asked if anyone was interested in having a copy with articles about the many activities going on during the month and a membership application. Fifteen people asked for it. Ruby RAV filled with two more passengers for the last ten miles of car travel to the trailhead through Santa Margarita Ranch and out toward Pozo. Huge valley oaks, bare of leaves during the winter, loomed in the fog, their limbs arching over the road and dividing into gnarled branches looking like arthritic witch fingers. At the trailhead the fog broke up and we took off at a breathless pace up the first long ascent through blue oaks and coastal scrub. The small trees were still bare, but black sage, California sagebrush and chamise were in fresh new leaf. People spoke about how hot and dry this hike was during summer. 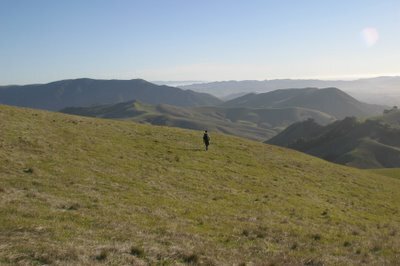 At the top of the first ridge, we took a break and looked out over the Santa Lucia range to Cuesta Ridge on the horizon hiding Edna Valley on the other side. 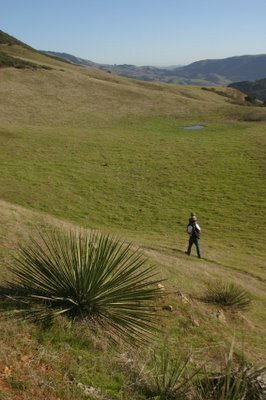 Heading downhill toward Lopez Canyon, one could see a series of parallel valleys to the south filled with fog. Other than a couple of water tanks and fireroads, nowhere on the whole hike were there signs of human habitation, not even a fence. 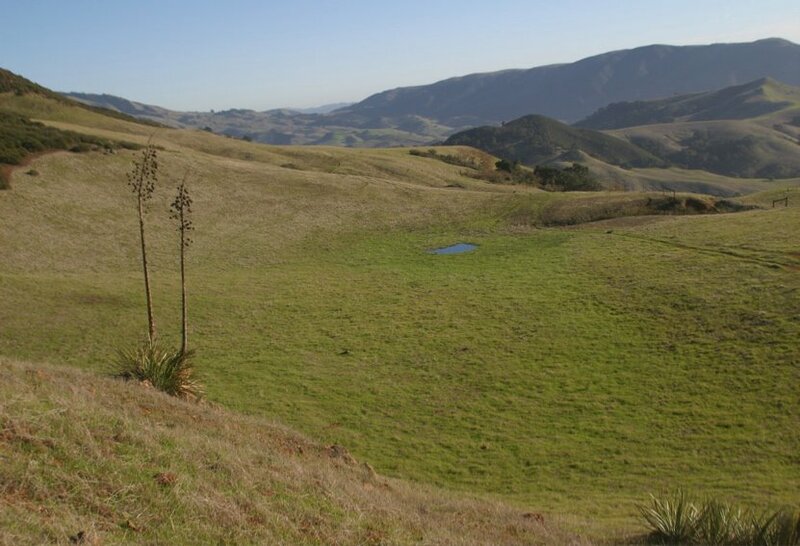 Occasionally the scrub and serpentine outcrops alternated with meadows, mostly gray with last years dead grasses, but showing the green of new growth hesitantly emerging. 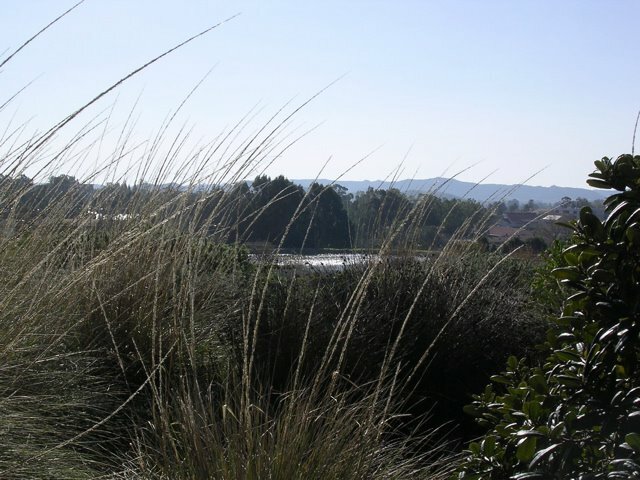 I saw hardly any of the annual grasses that filled the hills in the lower elevations; instead these were native perennial bunch grasses. Clearly this area had not been cultivated by the early settlers. The remains of the highway 41 fire of twelve years ago were still in evidence, but I thought that this area would soon welcome more fire, since in some places the scrub was getting thick and clotted with dead growth. The group was large enough to spread for half a mile along the trail, and it was fun to watch people far below on the steep slopes crisscrossed by switchbacks. They moved in shifting groups, pairs and singles and conversation flowed easily. and Chris noticed one large shooting star growing right alongside the trail. Soon we descended into a shady oak woodland of non-deciduous California live oaks. Then I noticed a series of pools beside the path that gave way to a trickle. For the next mile it dropped away out of sight but within earshot of its increasing babble. Suddenly we came out of the woodland to a crossing where the water flowed over smooth rocks and formed lovely pools surrounded by wooded canyon walls. This was the most pleasing part of the trail, and all too soon we we arrived at the top of the falls, where some folks decided to sit and rest while others explored the lip of the falls. The trail spiralled through woods down the fifty foot drop and returned to the base of the falls where most folks chose to eat lunch. There was a festive sense of arrival at a worthwhile destination. I really wanted to swim in the pool at the base of the fall–in my underpants. I took off my boots and crawled out on a log hanging over the clear inviting water. I knew it would be chilly, but I expected to be able to immerse my legs up to the knees until the pain went away and the rest of my body acclimated. This method had worked to allow me to swim for an indefinite time in the cold water of local beaches. But I couldnt leave my feet in for more than a minute or two at a time, and after a quarter of an hour I realized that my plan wouldnt work. So I stared at the tumbling spray and listened to its sounds and resigned myself to a chaste encounter. I’m sitting in an easy chair in an Oakland Starbucks, wireless blogging for the first time. We drove from San Luis Obispo this morning so Jan could meet a client in a retirement home across the street and go to an all-day workshop on estate planning in San Francisco tomorrow. By coincidence this place is also the residence of an old friend who’s had several strokes. We’ve planned dinner with her and her daughters tonight. When they were aged 2 and 4 in 1964, I was a graduate student and lonely lodger in their home. This is a familiar neighborhood. Half a block away is the apartment I inhabited for two months in 1989 while attending a National Endowment for the Humanities Summer Seminar at Berkeley, again as a lonely lodger. 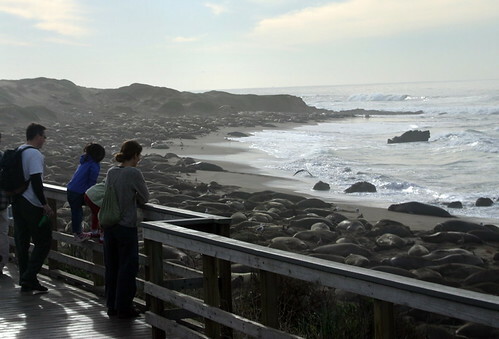 Yesterday’s Nature Explorers took us to the Piedras Blancas Elephant Seal viewing area a few miles north of San Simeon and Hearst Castle. 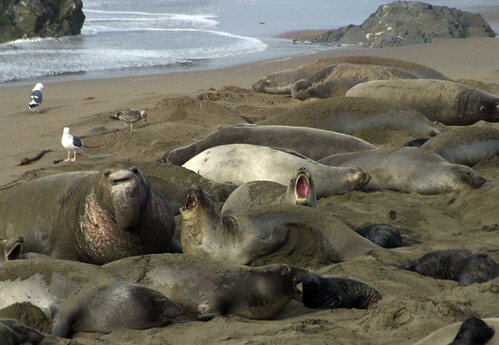 According to the Central Coast Friends of the Elephant Seals, this is the venue of “Mother Nature’s Big Show.” They dont exaggerate. Here one can witness the life force at work on a grand scale. 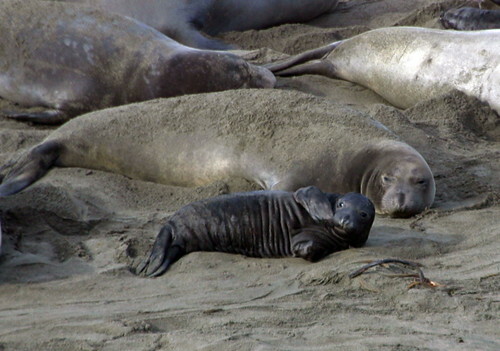 In a grayish-brown mass blending with the sand, thousands of bloated bodies lie packed on the mile-long beach, looking at first like the victims of a vast kill left behind by the tide. But the air is alive with shrieks, croaks and clicks emanating from what a closer look reveals as bubbling activity. 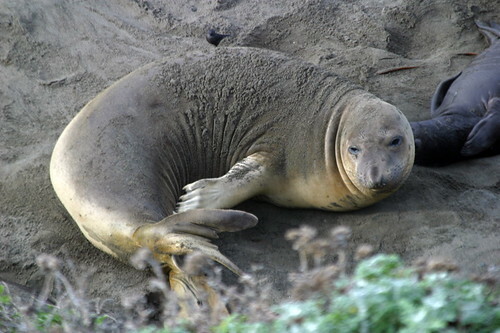 With handlike flippers, fat loungers toss puffs of sand onto their backs. Glistening black babies cry for their mothers and jockey for space at teats on smooth ovoid bellies. Mothers scream desperately to locate their offspring in the shuffling press. 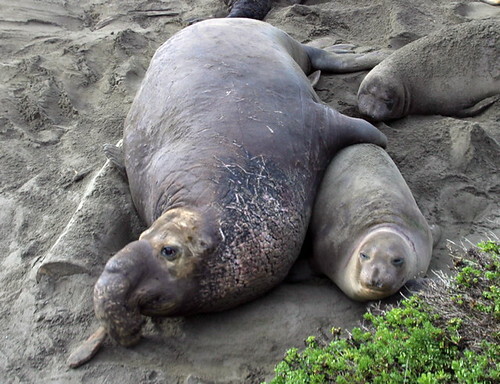 Young females arch skyward and howl, displaying bright pink mouths and sharp teeth. 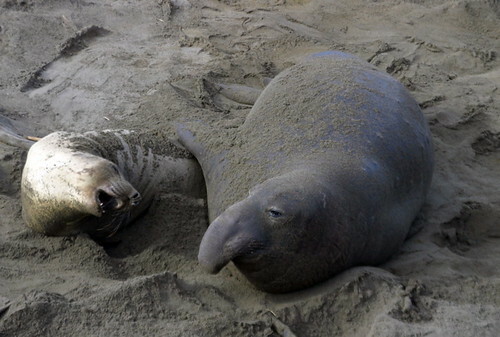 Pairs of juvenile males do push-ups with their foreflippers and face off with bobs and taunts. Mountainous old males erupt into motion, crash through the crowd, and scatter their junior rivals. Inamongst all this fierce and tender clatter gulls, jays and crows stand silently in attendance. And God said, Let the waters bring forth abundantly the moving creature that hath life, and fowl that may fly above the earth in the open firmament of heaven. And God created great whales, and every living creature that moveth, which the waters brought forth abundantly, after their kind, and every winged fowl after his kind. and God saw that it was good. And God blessed them, saying, Be fruitful, and multiply, and fill the waters in the seas, and let fowl multiply in the earth. 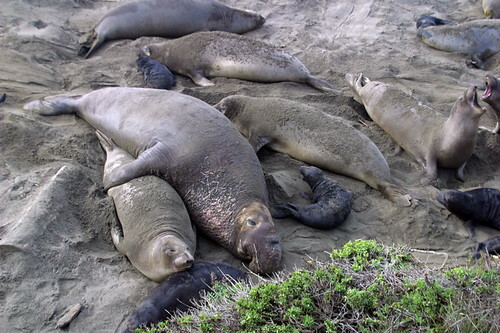 Despite the biblical blessing and my own reverence for biodiversity, I had second thoughts about the abundance and fertility of these creatures–their cacaphonous noise, the awful smell of their fish breath, their huge size, grotesque faces, clumsy movements, and the sheer numbers of their offspring. 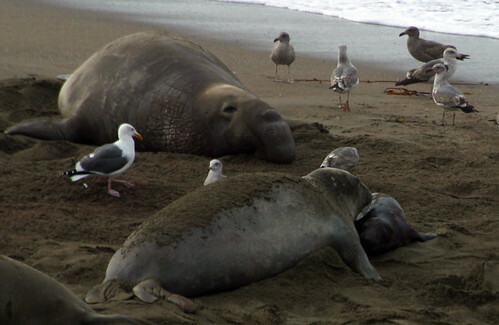 Not long ago, the Elephant Seal, Mirounga angustirostris was driven nearly to extinction by the market for its blubber, which supplied fuel oil from living rather than fossilized creatures. 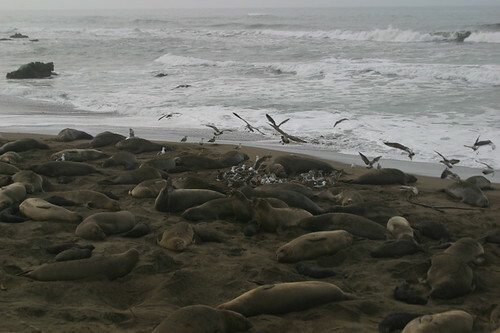 But now, as a result of the 1972 marine mammal protection act, their population has dramatically rebounded and they claim more central coast beaches amid complaints about their depleting local fishstocks. Our group made its way to the end of the boardwalk and stopped at one place long enough to start distinguishing activities and individuals among the seething mass immediately in front of us. Near the edge of the water someone pointed out that a pup had just been born. 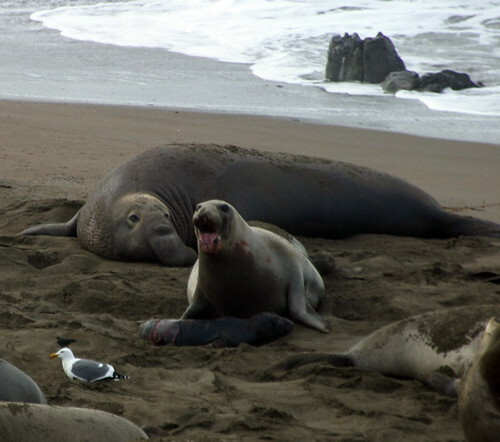 There was the large male, the half-sized female, and in front of her the new baby still covered with remains of the amniotic sac. We watched as, like a mother cat, she licked the prostrate infant into shape. Suddenly a flurry of screaming seagulls surrounded the mother and child blocking them from view. 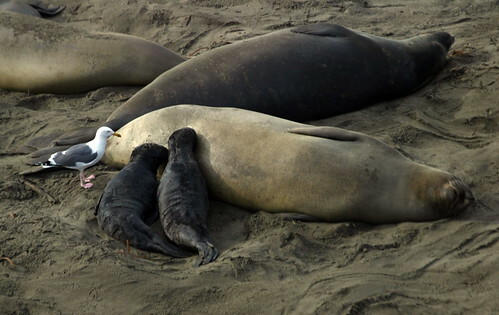 Could they be mobbing the baby, attempting to devour the new life? As they settled down, what was happening became clear. 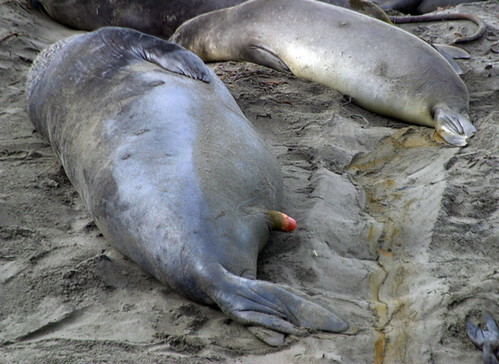 They were pulling and picking at slimey red strands of placenta that the mother had just delivered, cleaning up the beach, celebrating a birthday. Creatures of the sea and fowls of the air were brought forth on the same day. 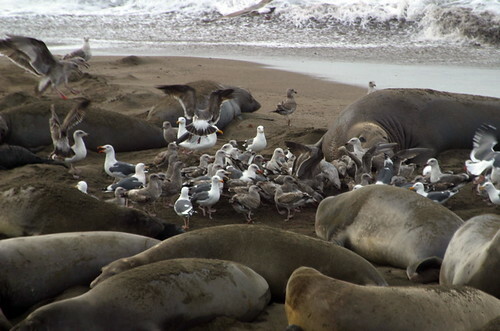 A sign at the parking area noted that one month after giving birth on this beach, females were ready to conceive for a second time during the winter mating season. Just below us on the boardwalk, a young silver-colored beauty with blue eye shadow posed and wiggled her tail, provoking a reaction from a nearby juvenile male. He sidled on over, placed a companionable flipper on her hip, and with half-lidded eyes did something that caused her to laugh. One thing led to another and soon they amiably hooked up. Undeterred by lack of privacy, they lay together peacefully for a long time, occasionally trembling or shifting positions. Suddenly, the male jumped off his mate as if shocked with an electric prod and shuffled speedily up the beach. From the opposite direction, a scar-chested warlord gallumpfed toward us, plowing a thick furrow in the sand. He landed heavily by an adjoining female, put his arm around her waist and pulled her close. The new couple snuggled and quivered for several minutes before the male withdrew. Then they switched sides and blissfully embraced. See you not how all animals, birds, as well as beasts, in their desire of procreation, are in agony when they take the infection of love, which begins with the desire of union; whereto is added the care of offspring, on whose behalf the weakest are ready to battle against the strongest even to the uttermost, and to die for them, and will let themselves be tormented with hunger or suffer anything in order to maintain their young. 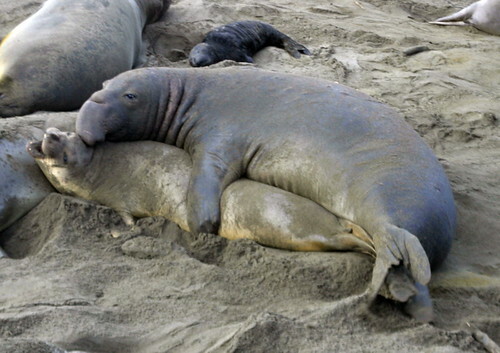 … why should animals have these passionate feelings? … the mortal nature is seeking as far as is possible to be everlasting and immortal: and this is only to be attained by generation, because generation always leaves behind a new existence in the place of the old. …according to that law of succession by which all mortal things are preserved, not absolutely the same, but by substitution, the old worn-out mortality leaving another new and similar existence behind–unlike the divine, which is always the same and not another. Watching the couplings of these animals affected me strongly. I saw in it a tenderness, grace, and immediacy that I had never witnessed outside of my own experience. 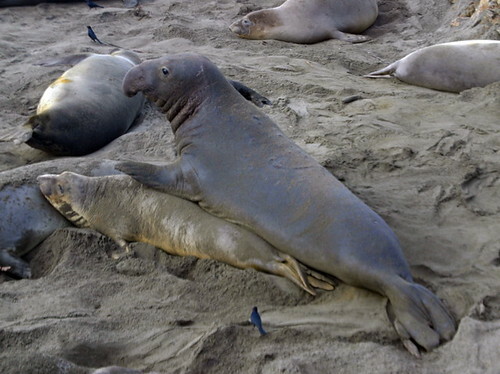 A bond of intimacy had formed between me and the elephant seals, driven alike by the force that “through the green flower drives the fuse”–the power of Eros. 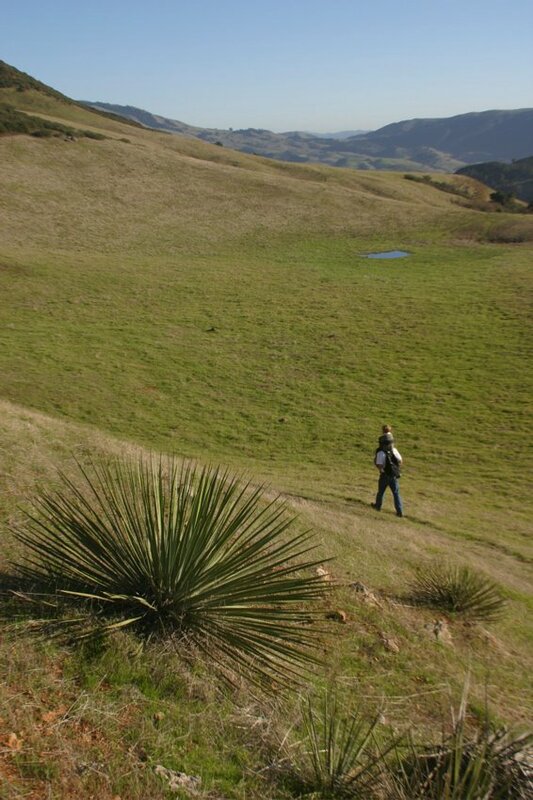 My colleague Craig and I hadnt taken a hike since our search for the source of Stenner Creek last July. Ian was still on recess from Nursery School. 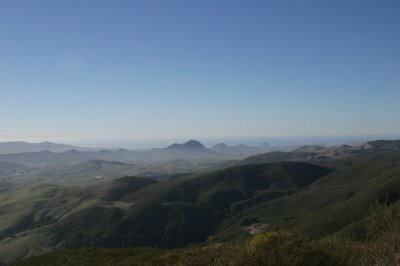 So last Friday afternoon the three of us drove in Ruby RAV up TV Tower Road on West Cuesta Ridge to make our way back by foot down to Cal Poly and home. though marred by the foreground presence of broken glass and several glistening piles of offal that looked like recently dumped deer guts. We passed by them hastily and clambered down the steep lip of the ridge top. I told Craig about the time I’d taken this route with my previous hiking buddy, Doug, who died six years ago of lung cancer. People were shooting old television sets in this sacrosanct spot, and after we passed them and rounded a curve in the fireroad, a spent bullet came over the bluff behind us and hit the back of his leg, tearing his pants, but not breaking the skin.Passing from Los Padres National Forest Land through a gate onto Cal Poly Land, we took a trail I’d never been on heading from the ridgeline toward the watercourse containing the immense oak tree I’d slept under many times, which I wanted to show Ian. 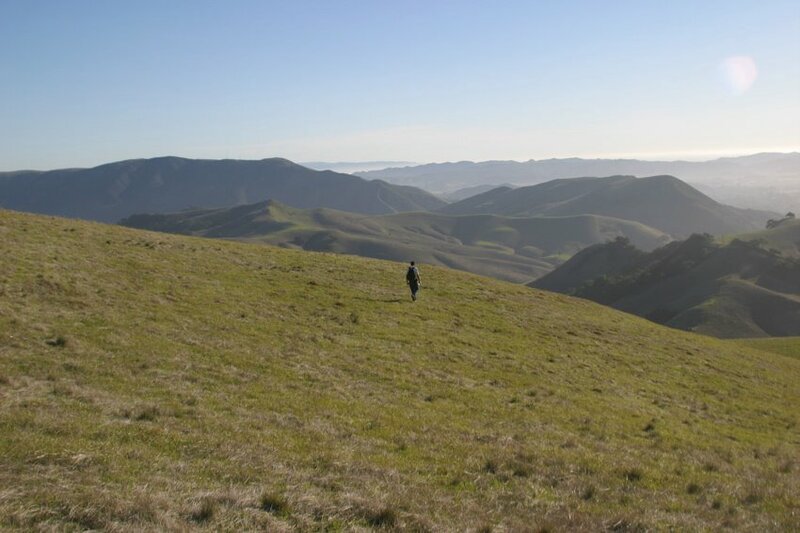 But Craig led the way and swerved south across a broad swath of grassland toward the top of Poly Canyon. At the shoulder line of the hill, we saw the landscape below center itself around a small blue mirror set in a shallow green hollow. I recognized it as a vernal pool. I’d never seen one on Cal Poly land before, and from this vantage it looked mysterious and powerful–a place where you might find a magical sword or a frog prince. The name of this geological feature had always appealed to me, and I had learned something about it in connection with struggles to preserve the small number that had remained in the Central Valley after 95% were destroyed by agriculture and development. The pools are formed, as are springs, where rainwater percolating downward meets an impermeable clay surface and finds no channel through which to run off. They provide habitat for rare species of plants, most of them native, endemic and endangered. 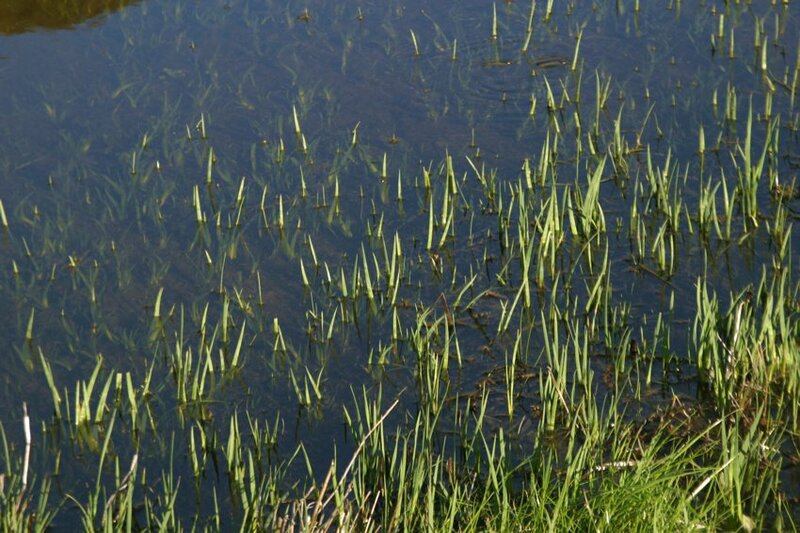 Because the pools emerge during the wet season and dry up during summer and fall, introduced species that havent evolved locally to adapt to these conditions cant thrive here and outcompete the natives. Many of them produce dramatic displays of flowers during the spring, after the water disappears but before the area dries out. Rare, ephemeral, and productive–we had come upon treasure. Ian was getting tired after a long day with no nap so Craig carried him on his shoulders while I lingered behind relishing the vision of the two of them crossing the gently curving greensward and closing in on that pure eye staring up at the firmament. I wanted to slow my own approach to the snail’s pace at which I sometimes travel alone in this countryside, but the afternoon was getting on. 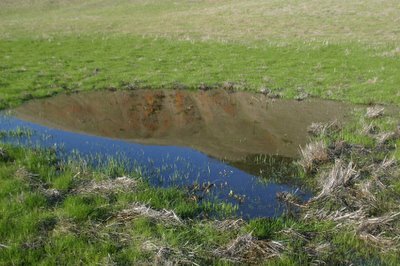 The closer I came, the greener and thicker the pasture, the more intense the reflections of red basalt outcrops and sky in the low angling light. To make cold nymphs chaste crowns. I wanted to strip, leap in the water and drink my fill, but fear of a cold and of giardia held me back. I wanted to be here alone with a sleeping bag and stay the night. I tried today, MLK’s birthday, to get back and check the changes in this pool after a weeklong dry period and the more recent rain. I arranged a hike with Ian and another four year old, Francis, his two year old brother, and their two parents, Tom and Jennie. We started at Serrano ranch but only got as far as Serrano station, where we picnicked and turned back. Instead of the pool we saw the crane train repairing the tracks and climbed embankments and haystacks. Vergil wrote this long poem about agriculture and rural life between 29 and 22 BCE and dedicated it to the Emperor Augustus. Its title derives from the Greek word for Earth–Ge or Gaia, and Ergon, or work: earth-work. I was prompted to reread it after spending time in the countryside of northern Italy last October. Its rich descriptions still apply to landscapes and methods of cultivation found there today, and its subject matter and style remind me of contemporary poets like Frost and Wendell Berry. A book called American Georgics by Timothy Sweet convinced me that it would be worthwhile to include early in the Ecolit course as a precursor of Walden. I’d told students that our second class would include a hike of the horse canyon loop but I doubted we could fit that into the palty 85 minutes we’d have, given the need to schedule fifteen minutes at start and conclusion for leaving and returning to the central campus. I was also planning a discussion of the Georgics and its relation to pastoral traditions, some linkages between passages in the text and what we might encounter along the way, and a twenty minute interlude for quiet reflection and writing in journals. As much as possible I would use the peripatetic method of lecture, urging students to move fast in a tight knot, walking backwards and shouting. In the construction sites and parking lots along Via Carta we talked of heritage trees that were saved from the bulldozer by the intervention of enviromentalists, and threats to Brizzolara Creek, the central artery of the campus watershed. Students in Animal Science and Biology contributed much to the walkalong lesson. 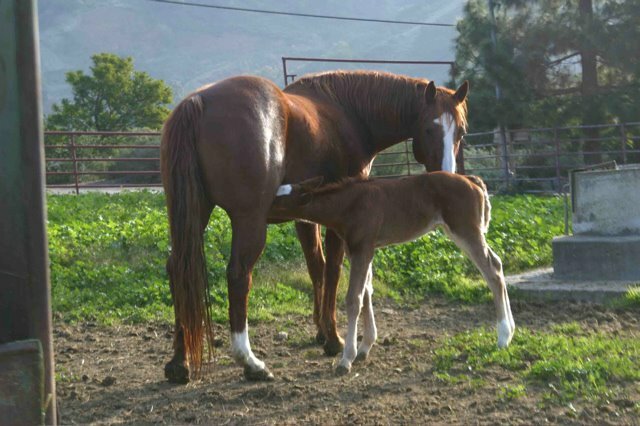 To care of sire the mother’s care succeeds. My watch battery had run down but I knew time was sliding by, so I decided to forgo the hike in favor of a tour of the Horticultural Unit and the Leaning Pine Arboretum. 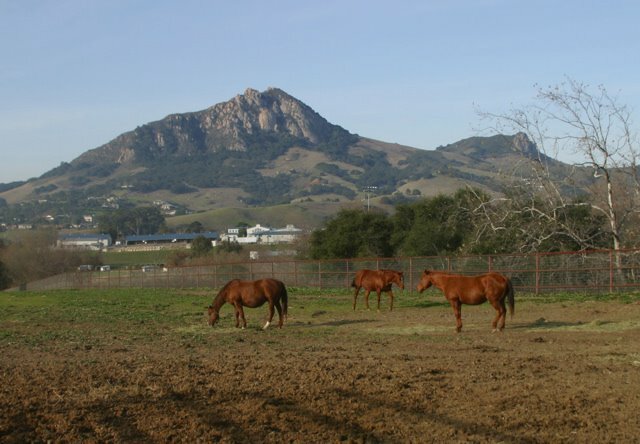 Alluding to what I learned from Animal Science Professor Rob Rutherford, I pointed out that the production of food and fibre was the original purpose of Agriculture and the School of Agriculture that Cal Poly started out as. But following the industry and the money, the fastest growing departments here now were Equine Science and Horticulture. These are dedicated to recreation and decoration, since that’s where the jobs and resources of our luxury-oriented economy are directed. Walking through the greenhouses we spoke of alternative methods of pest management and outside near the experimental turf plots and formal gardens, we considered alternative directions for horticultural science: sustainable and unsustainable. As we entered the Arboretum’s California Gardens, I talked about how they inspired me to rip out my old lawns and shrubs and sprinkler systems and plant the California natives which require fews inputs and create no waste–with the guidance of ex Ecolit student and present day manager Chris who was working down the path. Stopping by a beautiful white-limbed specimen of California buckeye–the genus of Aesculus mentioned several times by Vergil when he speaks of the Italian chestnut and horse chestnut– we noticed the winter-spring buds swelling at the growing tips of twigs and bursting from the middle of thick branches bare to the light stimulus of the southern sun. Passing through a damp grove of redwoods, we came upon the experimental Carex plot, after the recent rains greener and fuller than I’ve ever seen it, proof that the right native perennial bunch grass can replace the water and chemical dependent lawns that are depleting our naturally arid lands. At the end of the garden we observed the great scar of the quarry-dump on Poly Mountain overlooking the future site of the 2700 resident Student Housing North development, while a redtail hawk circled overhead showing off his bright underwings. What was supposed to have been a hike turned out a brief stroll concluded with fifteen minutes of journaling and repose on a circle of stones in the shade of a cypress tree. “A wild Santa Ana wind blew off a shingle last night, the first one since the roof was laid fifteen years ago. 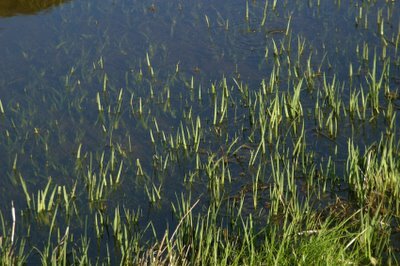 Now it’s a steady breeze from the east making ripples on Drumm reservoir that sparkle among silver clumps of deergrass. A meadowlark yodels on a fencepost at the edge of the old Bull Test’s flourescent green pasture. Never again will it be manured and cropped down to dirt. 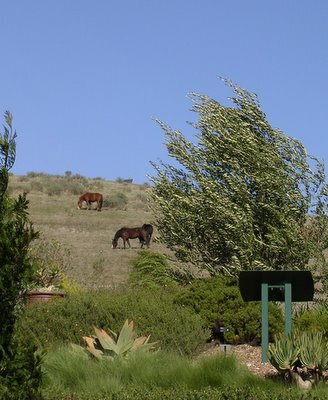 At the foot of Caballo Peak the mares nibble in the lovely surroundings Vergil recommends.